MBAs enjoyed plenary sessions in the cultural and historic heart of the capital. The day opened with MBA alumnus Greg Fincke, who gave a presentation on ‘The power of network effects in M&A’, focusing on the sell-side of deals. Greg, who attended the first ever symposium, spoke about the importance of building and leveraging a community of networks and then understanding the synergies that exists within it. You need to know the landscape of your network. If you don’t, then you just become part of the noise. 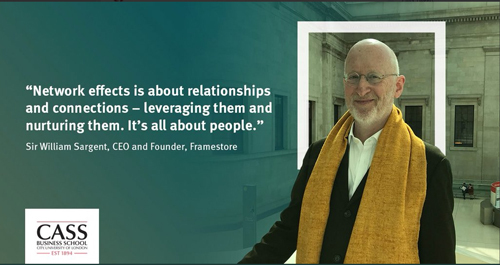 The MBA Symposium welcomed back Sir William Sargent, CEO and Founder of Framestore and Honorary Visiting Professor in the practice of Leadership of Creative Industries at Cass. Sir William focused on the power of storytelling to build effective networks inside and out of a business. "Storytelling is key. Fundamentally, our lives are dominated by it, and when we do it well, we are highly impactful." Sir William has been leading innovation for over thirty years. Framestore’s culture is about enabling innovation and going into adjacent markets: from creating the visuals from the 2018 South Korean Winter Olympics to being the sole creator of content for Marvels’ new Guardians of the Galaxy interactive ride at Disney, Framestore’s culture is about enabling innovation and going into adjacent markets. Sir William stressed the importance of enabling a creative culture. He said, “We don’t just do things because it’s a good business model. If there’s no one passionately championing a project internally, we won’t do a project." Next on stage was Natalie Reynolds, CEO and Founder of advantageSPRING and an honorary visiting professor. She delivered a high-energy masterclass in the psychology of negotiating by challenging the audience to consider their own internal networks of different negotiating styles. Natalie explained that negotiations are a fundamental part of our daily lives, not just the boardroom. She said, "How you negotiate can set you apart." I want you to challenge conventional thinking about negotiating. Being uncomfortable with this skill is common, and even having years of business experiences doesn’t make you immune. The last plenary session of the day was given by author Matt Watkinson. His book The Grid, described as "the decision-maker’s best friend", is a tool that lets you see business as an interconnected whole. "A business is a connected whole, but we don’t act like it," said Matt. "When we look at the businesses, we find a lot of analysis, but very little focus on synthesis." The Symposium will continue at the The Royal Institution on Wednesday.